It’s there – the best booking calendar ever! 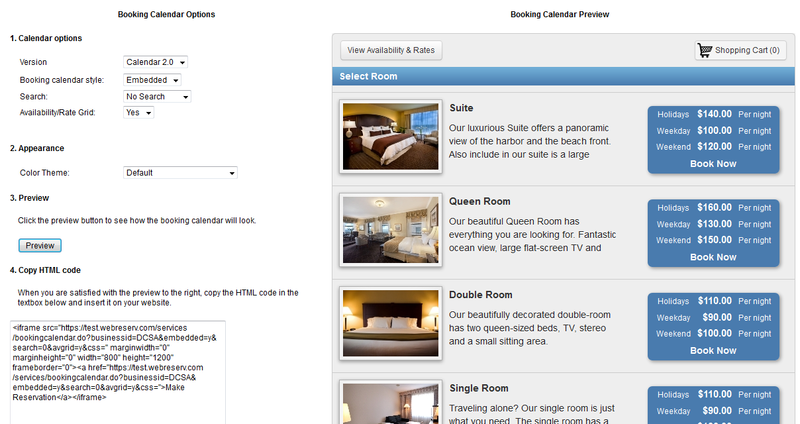 We are very excited to announce the completely new and redesigned Booking Calendar for your business. The new booking calendar is completely redesigned and rebuilt from the ground up to give your customer’s the best booking experience ever – whether they book from their desktop, laptop, tablet or smartphone. 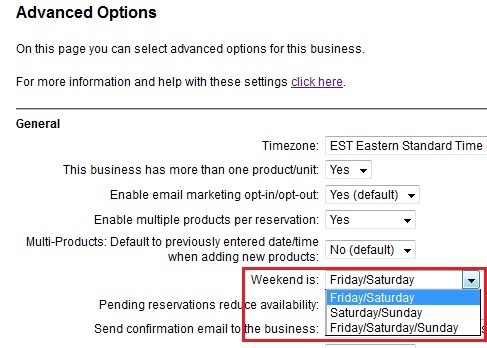 To add the new booking calendar to your website, log on to your WebReserv account and click Website in the top menu. Version: Select Calendar 2.0 for the new booking calendar. This entry was posted in Booking Calendar, New Features, Plugins, Tour Bookings and tagged bed & breakfast booking system, booking calendar, online booking system, tour booking system, vacation rental booking system. We are pleased to announce that we have released a new version of the WebReserv booking system. 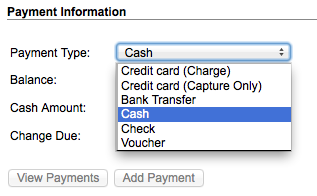 The new version allows for up different pricing levels for up to 25 people when using variable rates. As part of this update, there has been a minor change to the way the system calculates the rate. If you are using Per Person (variable) in your setup, we recommend that you review these changes and update your settings if necessary. When a room/rental/ tour is set to Per Person (variable) as the rate calculation type, the system will pick the rate from the column that matches the number of persons. If no rate is defined for this number of persons, the system will try with a lower number of persons until a rate is found. Say for example that you have entered a rate for 1, 2 and 3 persons as shown below. If a reservation is made for 2 adults, the rate will be $55.00. If a reservation is made for 3 adults, the rate will be $80.00. However, if a reservation is made for 4, 5 or 6 adults, the rate will be calculated as $80.00 as there is no rates defined for 4, 5 and 6 adults. If the rate per person is the same regardless of the number of persons, we recommend that you change the rate type to Per Person (flat). This entry was posted in Rate Calculation, Tour Bookings and tagged tour booking system, vacation rental booking system. The new version of the WebReserv booking system includes the ability to automatically add arrival and/or departure information to reservation emails. The arrival/departure information is often used for vacation rental booking systems and for property management booking systems, but can also be used for other types of businesses. To add arrival and/or departure information to a rental or tour, go to Setup – Products & Reservation Rules – [Select Product] – Reservation Rules. The arrival/departure information fields are located at the bottom of the page. This entry was posted in Booking Calendar, New Features and tagged property management booking system, tour booking system, vacation rental booking system. Log into your WebReserv Account. Name – give a specific name for the category, in this case, Holiday. 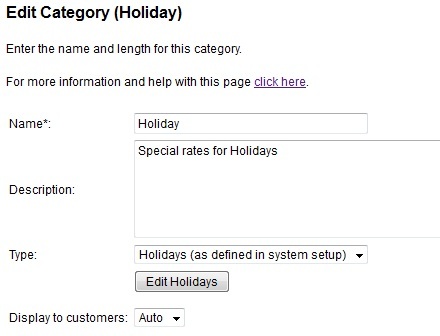 If you have not yet set up Holiday Hours in the system, click the Edit Holidays button below the Type. 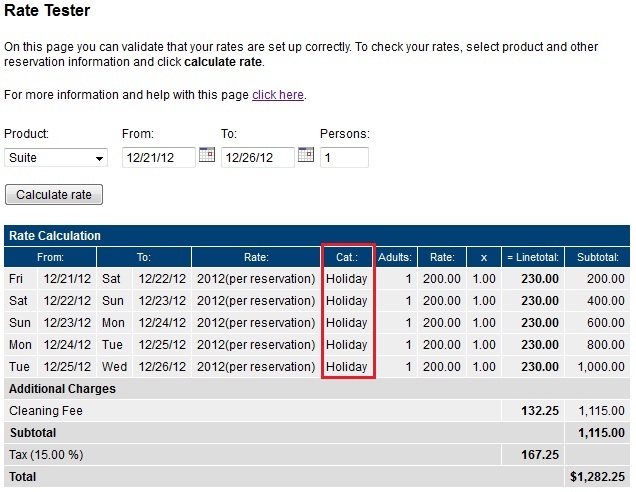 You can define specific holiday dates and set minimum stay requirements, if applicable. Next, you will enter the special rates for your holidays in your Rate List. Go to Setup – Rates. On the Rates page, you will click on the Rate List to edit. In the Rate List you will see the new Holiday Rate Category you just created. Enter the special rates for the holiday for each room/rental. Click Save and continue to save your changes. Finally, use the Rate Tester to ensure the rates are calculating properly for the holidays. Go to Setup – Rates. Click on Rate Tester in the left hand column. Enter room and holiday dates. The Rate Tester will show you how the rate for each day is calculated. It also indicates which Rate List and Rate Category the system is pulling the rates from, which in this case, is the Holiday rate category. Success! 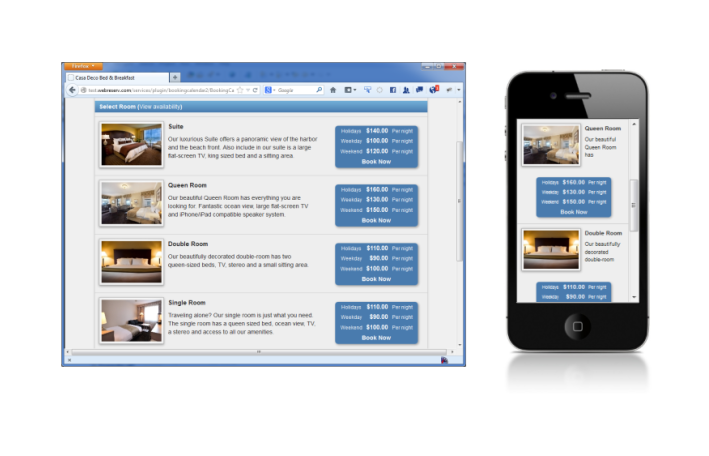 You have now set up Holiday Rates in WebReserv. This entry was posted in General, Managing Holidays and tagged bed and breakfast specific, how to, self catering accomodation, vacation rental booking system, webreserv special holiday rates.